hold aloft a model of Explorer I, the first successful US satellite, launched Jan. 31, 1958. Satellites had been orbiting in von Braun's mind ever since he read, as a young teenager, Professor Oberth's book on the rocket to interplanetary space. At age 15, he knew how to calculate the velocity a rocket had to reach in order to place a satellite into an orbit at a given altitude. He wrote articles on rockets, orbiting space stations, and travel to the Moon for his high school journal, and he decided at that time that during the rest of his life, he wanted to help open the road for man's travel to his celestial neighbors. While von Braun developed long-range precision rockets under the Army's auspices in Peenemunde, he was not allowed to mention the use of such rockets for space exploration. After the war, when he and a number of his associates had settled in Fort Bliss in Texas, he enjoyed the freedom to think and even to talk and write about rockets for space flight, and he did so whenever he had an opportunity. In 1952, while he developed the Redstone rocket in Huntsville, he once mentioned to me: "With Redstone, we could do it!" - "Do what?" was my puzzled reply, "Launch a satellite, of course!" he said, and he described how a cluster of three stages of small solid propellant rockets instead of Redstone's warhead could place a satellite of a few kilograms into an Earth-circling orbit. Two years later, in 1952, von Braun thought that the time had come to suggest a satellite project to the Army, based on existing and flight-proven rocket components. Actually, the composite multistage Redstone rocket that he suggested for a satellite launch was also needed for another purpose: At that time, his team developed the 1600-mile Jupiter missile which needed a thermal protection for its nuclear warhead while it reentered the atmosphere at high speed. Von Braun suggested a protective coating of the warhead that would ablate under the intense heating during reentry, but this novel technique had to be tried out under realistic conditions before it could be used on Jupiter missiles. A multistage Redstone rocket would be almost ideal as a testbed for ablation warheads. Two upper stages of solid propellant rockets would be adequate for reentry tests; with three such stages, a satellite could be launched. Von Braun's proposal for a Redstone satellite, worked out jointly by von Braun's team at Redstone Arsenal and members of the Office of Naval Research who later were joined by the Jet Propulsion Laboratory, was not accepted. Instead, the government opted for a satellite proposal submitted by another Navy team, based on a new rocket named Vanguard. Around that time, Soviet Russia announced plans to develop a satellite and to launch it in 1957; both the American and the Russian satellites should be part of the research program of the International Geophysical Year. Von Braun's reentry test program began with a first launch on September 20, 1956 when a multistage Redstone rocket reached an altitude of 1097 km and a distance of 5470 km. The reentry test program for Jupiter warheads met with full success. Meanwhile, the Vanguard project encountered difficulties. General Medaris, at that time commander of Redstone Arsenal, and von Braun offered the Army's help, even to the extent that the Navy's satellite would be launched with a multistage Redstone under the name Vanguard, but the Navy declined any help from the Army, and von Braun was not allowed to build and launch his Redstone satellite. In the meantime, public statements by Soviet scientists about a Russian satellite became more frequent, but most Americans, up to the highest ranks in the government, would not believe that Soviet Russia would be able to build, let alone launch a satellite. Then, on October 4, 1957 Sputnik began circling the Earth, proving to the World that America was not first in space. 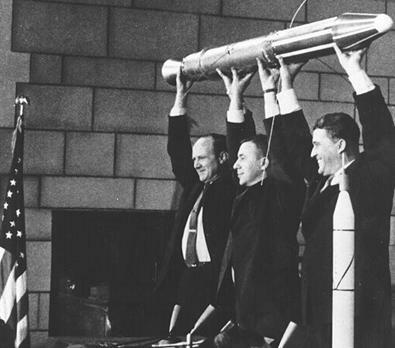 The shock throughout the country was immense, but it took another heartbreaking failure of Vanguard, another Sputnik with the dog Laika aboard, and another four weeks of desperate waiting before the von Braun-JPL team received permission to put together a Redstone rocket with three upper stages and a satellite, equipped with Dr. Van Allen's cosmic ray counters, and to launch it. After less than three months, the composite Redstone launched its satellite into orbit; it was named Explorer I, the first satellite of the free world. "We have now established our foothold in space, we will never give it up again", von Braun said. This was the first of several thousand satellites and space probes launched by engineers and scientists all over the Earth. They have brought such marvelous things as worldwide instant communications, a continuous look at all parts of our planet, education from orbit, a wealth of scientific knowledge about the Moon, the planets, the stars, and the universe, and, perhaps most important, an intense awareness of the fragility and vulnerability of the thin layer on our Earth in which we live, its air, its water, its green cover of plants, its animal life- in short, of all those features of planet Earth which make it possible to live and stay alive in our earthly home. This awareness alone, I believe, is sufficient to justify the effort and the expenditures to build, launch, and operate satellites and probes into the vast spaces that surround our planet Earth.